Gate Seal - Beaumont Technologies, Inc.
Gate Seal – The time at which the polymer at the gate is frozen and no more plastic can be packed into the cavities. Ideally gate seal should occur after the part has been sufficiently “packed out” providing maximum control of shrinkage and warpage of the part. Pack/hold pressure should be applied until gate seal is achieved. If gate seal occurs too early, the processor will lose the ability to pack out the part. 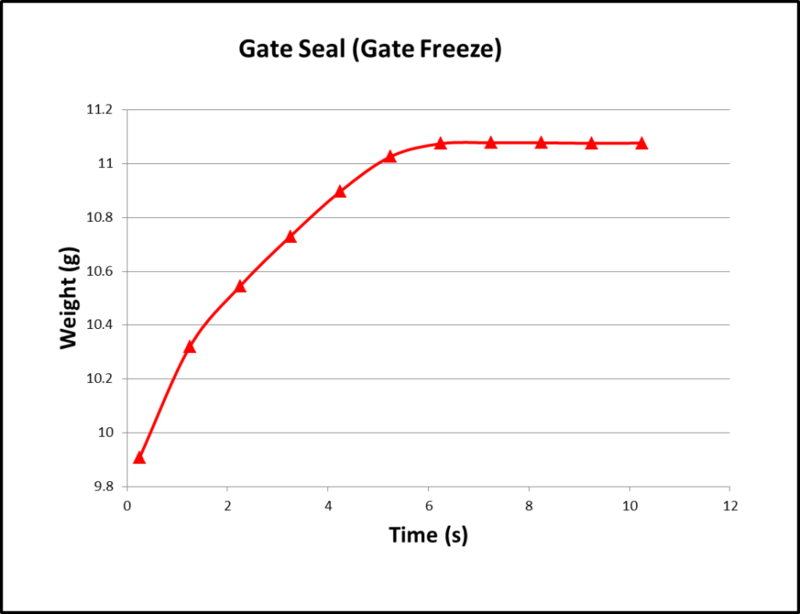 Gate seal time is determined by a variety of factors including gate design, gate size, and process variables such as injection speed, melt temperatures, mold temperature, etc. First establish a desirable injection process, including fill time and pack pressure. Initially set pack time to a minimum and weigh the molded part. Continue molding and weighing parts while progressively increasing hold/pack time (usually by 1 second at a time). Finally plot the weight of the molded parts vs. pack/hold time (see graph below). Part weight should initially be seen to rise with increasing pack time. Once the weights remain constant you know you have achieved gate seal as no more plastic is entering the cavity. In the example below, gate seal is occurring at 6 seconds.